Remaining physically active as you get older is essential for maintaining bone density and lean muscle, for keeping your body-fat percentage within a healthy range and for preserving the health of your heart, circulatory system and lungs. As you get older, your metabolic rate, muscle mass and bone density decrease and your risk for joint issues increases. The best machines for those over 50 are ones that improve cardiovascular fitness, burn calories, strengthen muscles and bones and protect joint health. There is a variety of exercise machines that you can use to exercise safely and still get a good workout. Based on your fitness level, current health status and exercise preference, one machine may be a better choice for you than others. 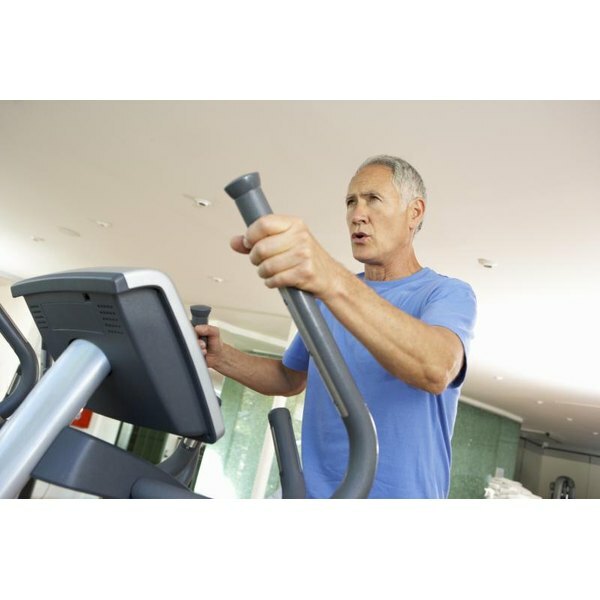 If you suffer from arthritis or other joint issues in the ankles, knees or hips, riding on an upright or recumbent stationary bike is a good option. Because cycling is a non-weight-bearing activity, it's easy on the joints. If you have lower-back issues, the recumbent stationary bike can support your back while you do your cardio exercise. However, because cycling is a non-weight-bearing exercise, it won't help you improve bone density. If you have poor cardio fitness or are overweight or susceptible to balance problems, you can still get in a good workout while seated on a stationary bike. If you're in great physical shape, you can increase the resistance on your bike or pedal faster to kick up the intensity of your workout. A 50-year old person weighing 150 pounds will burn about 238 calories during a 30-minute, moderate-intensity stationary bike workout. Because walking and jogging are weight-bearing activities, they’re effective at building and maintaining bone density. With age, bone density naturally decreases, increasing the risk of osteoporosis and fractures, so walking or jogging on a treadmill can help those over 50 to limit bone loss. The treadmill allows you to increase the speed of the belt so that you can walk or jog at a pace that's safe and yet challenging for you. All the major muscles throughout the legs contribute to walking or running, and you can increase the incline of the belt if you'd like to use the treadmill to build leg strength. In 30 minutes, a 50-year old person weighing 150 pounds will burn about 176 calories walking on the treadmill at 4 mph and about 342 calories running on a treadmill at 6 mph. Step machines, ski machines and ellipticals all place you in a standing position, which means they’re all considered weight-bearing exercises. Because of this, the machines can help those over 50 build bone and muscle. Step machines, because they mimic climbing stairs, are better for building leg strength. Ski machines and ellipticals are both low-impact machines, which is ideal for those over 50 who are struggling with knee, ankle and hip problems. Ski machines, which involve sliding the feet forward and back, incorporate your upper-body muscles as you pull on the handles, which can strengthen the shoulders, triceps and biceps in those over 50 who wish to develop upper-body strength. Elliptical machines require you to cycle your feet in an ellipse shape, and some also feature handles that slide forward and back to recruit the upper body. In 30 minutes, a 50-year-old person will burn about 238 calories on a stair stepper, about 328 calories on a ski machine and about 387 calories on an elliptical machine. For those over 50 who suffer from lower-body joint problems, the rowing machine offers an opportunity for a safe yet highly vigorous workout. The rowing machine requires a coordinated effort from muscles throughout the lower and upper body. The workout is low impact, so it's easy on lower-body joints. The lack of impact with rowing, however, means that rowing machines aren't the best option for those looking to build bone density. Because of the intensity and coordination needed, rowing is a good option for those over 50 who are physically fit and want to build strength in muscles throughout the entire body. A 50-year-old person exercising at a vigorous intensity for 30 minutes will burn about 297 calories. Rowing places a high demand on your lower back, so if you suffer from lumbar pain, working out on a rower could exacerbate the problem. Do You Burn More Fat Holding Onto the Rails on a Treadmill or Not?